Bruce Springsteen’s music means a lot to many people, but it’s hard to imagine anyone who finds it more inspiring than superfan Rosanne Gialanella. Now living with stage 4 cancer, Gialanella listened to Springsteen’s music nonstop during tough chemotherapy and radiation treatments and embarked on a one-woman campaign to turn every doctor into a fellow Springsteen worshipper. Here she talks to HealthCentral about surviving breast cancer for more than a decade and thanking Springsteen backstage for the incredible gift of his music. HealthCentral (HC): Rosanne, tell us a little about yourself. You’re a Jersey girl? Rosanne Gialanella: I was raised in New Jersey and also lived in New York City and Florida. I was a buyer and merchandiser for Nordstrom, but I moved to Seattle in 2002 for a job as an account executive in the cosmetic industry. I lived there for 14 years before coming back to New Jersey. I’m an artist, I’m very creative, and I love fashion. I’m a Look Good Feel Better trainer for the American Cancer Society and a Lance Armstrong Foundation Livestrong trainer as well. I believe in getting dressed up for life. HC: Could you tell us about your cancer journey? It’s been a long one. Gialanella: It started in 2006. I had a mammography and it turned out I had stage 1 cancer. I had a lumpectomy and a mastectomy of the right breast with reconstruction; I was fine. And then, in 2011, I was dragon boating with some friends and I felt this tiny, tiny little pea under my arm. And my doctors were like, “No, your scans are perfect, your blood work is perfect.” Fortunately, I trusted my gut, and unfortunately, I had stage 3 cancer. All the doctors were stumped, and my surgeon was so upset — the cancer either was misdiagnosed or it just didn’t show up because, as you know, cancer is very sneaky and it’s also unpredictable. So that was 2011. I had axillary node dissection, which means they took out 10 nodes and five were covered with cancer. So then I had to start some heavy-duty chemo, followed in 2012 by really aggressive radiation. I decided in 2013 to have the left breast taken off but unfortunately didn’t get the best care and developed a really bad infection, so I don’t have a breast on the left side. Then, in 2015, I was helping a friend who was going through cancer and she was constantly talking about scans. I hadn’t had one in a while because we thought I had “no evidence of disease.” So this little voice inside me said, go for a scan. It turns out my cancer had spread. Now I was stage 4 and it had gone to my liver. So I had a liver resection with a really fabulous surgeon in Seattle named Julie Gralow. In 2016 I made a huge, huge decision and moved back to New Jersey because my older siblings were here. I left all my doctors, all my friends, and started over, having no idea how challenging that would be. But I said, if I can live on the ocean, I can do this. I always say I’ve been riding this wild wave. I’ve been very fortunate to have a strong life force. I’m currently being treated at Memorial Sloan Kettering Cancer Center in New York. HC: How have art and music helped you live with cancer? Gialanella: It started when I was going through chemo in Seattle. I brought my sketchbook and music, and the whole time I would sketch and listen to Bruce Springsteen. Music and art have been really healing for me, so I have tried to use that to help other people. I just went to a retreat and did my art workshop for many, many cancer survivors in Texas. I call it PACE — Promote Artistic Creative Endeavors. I always made CDs for all my doctors. I had 10 surgeries in 11 years, so all those surgeons and radiologists, all the doctors, got CDs of music from Bruce Springsteen. “Dancing in the Dark” is my favorite song; whenever I’m sad or even when I’m happy, I dance in the dark. So all of that is really meaningful to me. 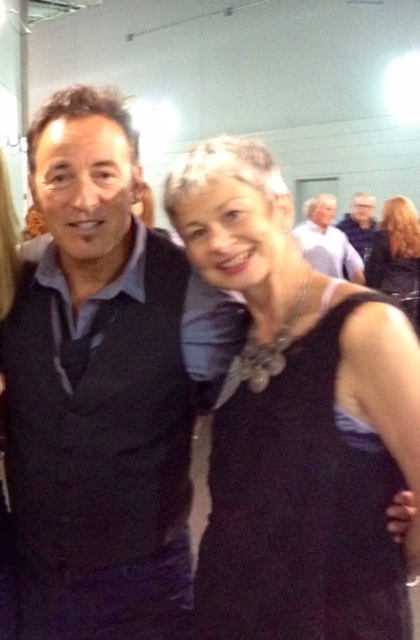 Rosanne posing with her hero, Bruce Springsteen, for a photo. HC: How did you come to meet Bruce in person? I had made this huge blowup [photograph] of myself in my yellow boxing gloves on the last day of chemo, and my goal was to give it to Bruce. We got concert tickets and flew from Seattle to New Jersey to see him. I brought a friend, because all of my friends who once didn’t know who Bruce was now loved him because they were part of my team. Bruce Springsteen wrote Rosanne an encouraging note to keep fighting. When I met him with my niece and a friend, he came out with his wife, Patti, and he greeted us all and hugged us — and he kept hugging me. He was very loving and sweet. He said, "Now we know your number and we’ll be coming to Seattle." Well, he didn’t come that year, but he came last year, and a friend of mine put my story on Facebook and they sent us free tickets. HC: In 2017 you modeled for an event during New York Fashion Week; there’s a fabulous video of you looking glamorous and dancing down the runway. What was that all about? Gialanella: That’s from a “Say YES! to Hope” campaign by a nonprofit called YES! that supports people affected by liver tumors. Suzanne Lindley, the founder, is a friend of mine. There was a whole group of us with metastatic cancer on the runway, outfitted in Dalia McPhee’s dresses. It was a huge fashion show and we were the representatives of metastatic cancer. I used to do modeling a long time ago, so I was in my element. They asked me to go out first after this one solo guy and I just started dancing, because that’s what I do. It was really spontaneous and it opened things up in a fun way. I’m really trying to get the message out there that even if we have a chronic disease, we have vitality, we’re alive. I always say, there’s a difference between empathy and sympathy. Empathy is understanding and listening; sympathy is when people look at you like you’re dead. We’re not dead! I think that’s a really important thing to understand. How and Where Does Metastatic Breast Cancer Spread?